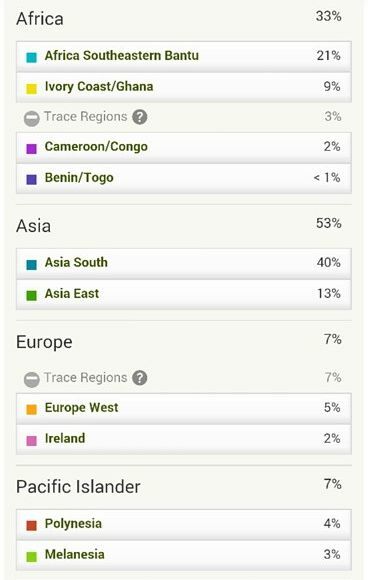 On this page I will be posting the AncestryDNA results for people from Central and Southern Africa with confirmed ethnic background(s). Unlike for Afro-Diasporans in the Americas these results can therefore be verified with known genealogy. This should be helpful to determine how reliable/predictive the various African AncestryDNA regions might be and also how they should be interpreted. Most DNA is common in many populations, just at different frequencies. Due to either migrations or shared origins dating back from hundreds or even thousands of years. 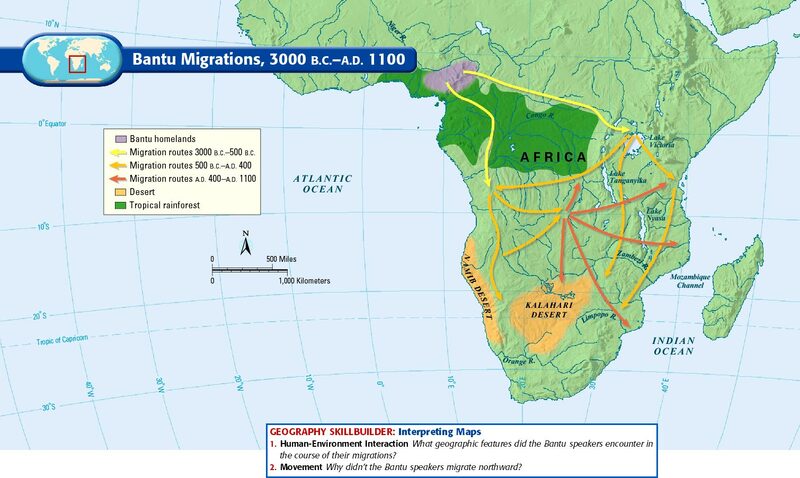 For Central & Southern Africa in particular the Bantu migrations are a factor of paramount significance. Ethnicity is a construct which evolves across time due to ethnogenesis. Generally speaking therefore ethnic groups do not possess unique DNA markers. Especially in comparison with neighbouring ethnic groups or from within the same wider region. The most common scenario being a genetic gradient which causes ancestral components to gradually fan out. As can be verified from chart 1 & 2. However by closely studying the regional combinations being reported for Central and Southern Africans we can still learn a great deal. Inspite of individual variation group averages do tend to provide more solid ground to make meaningful inferences when specifying someone’s ancestral origins. Also finding out where a specific region is most prominent or rather most subdued holds valuable lessons. The above statistical data is evidently based on a minimal sample size. Also a restricted set of countries is being covered. Almost all of these countries themselves already harbour a multitude of ethnic groups. It should be obvious that a much greater degree of genetic diversity and individual variation might be expected across Central & Southern Africa and also within the listed countries. 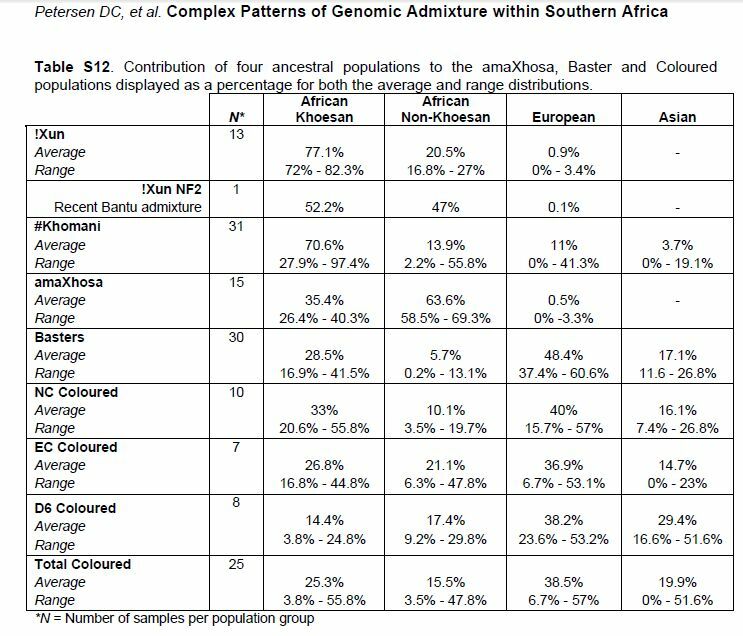 Some of this diversity can already be gleaned from the more specified South African data which is mostly representative of samples taken among the Coloureds. Their African breakdown has been scaled to 100% in order to enable an evenhanded comparison (same goes for results from Zimbabwe, Madagascar & Mauritius). 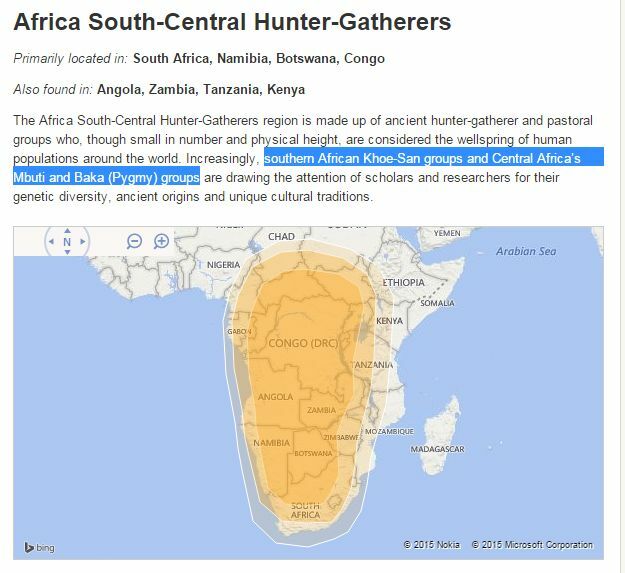 The socalled “South-Central Hunter-Gatherer” region (termed “Pygmy/San” in my sheet) is very significant for the Coloureds. But it is likely to be less prominent for Bantu speaking South Africans, even if still very detectable on average, in particular the Xhosa. Eventhough only preliminary statements should be allowed at this stage i highly suspect that these group averages are otherwise already a reasonably good approximation of the main ancestral components to be found within the Central and Southern African genepool. Atleast according to AncestryDNA’s current reference panel. 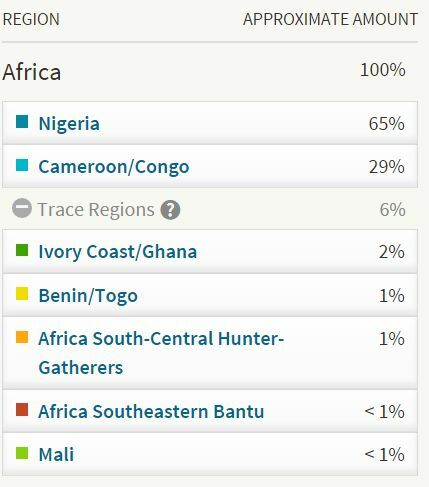 The group averages i have calculated sofar being very much in line with how the “typical native” scores according to Ancestry’s information: respectively 92% for “Cameroon/Congo (n=115) and 72% for “Southeastern Bantu” (n=18). Especially the former region having a very robust prediction accuracy. Because it is able to distinguish Bantu speaking origins from both Central & Southern Africa AncestryDNA’s analysis (K=9) has a huge advantage above 23andme’s inadequate African regional resolution (K=3). 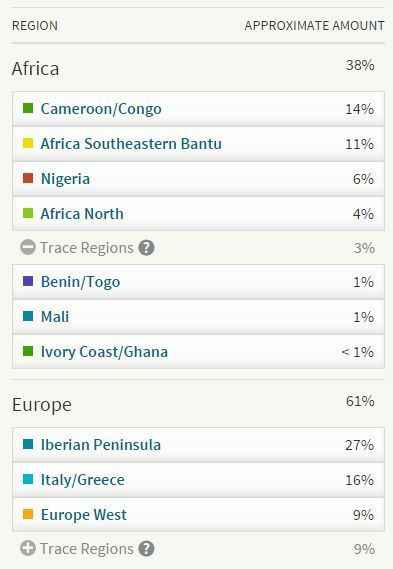 Even when the socalled “Cameroon/Congo” region might also pick up on strictly Bight of Biafran (eastern Nigeria and Cameroon) ancestry. But this will only be relevant for Cameroonians and Nigerians (and their descendants within a recent timeframe of ~500 years). Furthermore Nilo-Saharan and/or Cushitic ancestral connections might be hinted at in which cases the socalled “Southeastern Bantu” region will clearly be mislabeled. But this will only be relevant for a few selected ethnic groups within Central Africa who have either geographical, linguistic or (pre)historical connections with Northeast Africa (mostly restricted to the northern and eastern parts of the Congo (DRC)). 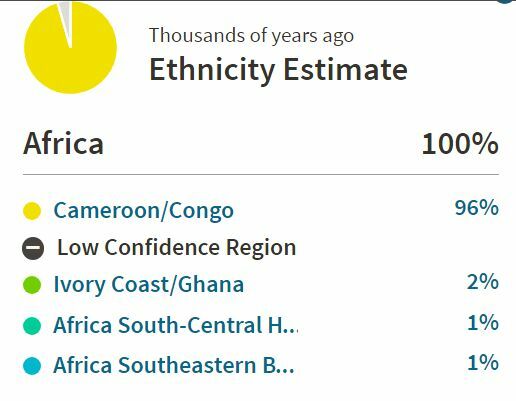 It should be kept in mind that the actual amounts being reported for the socalled “Cameroon/Congo” or “Southeastern Bantu” regional components are firstmost a measurement of the genetic similarity to AncestryDNA’s (limited) samples from either Cameroon & Congo or Namibia, South Africa and Kenya. An attempt is being made to pinpoint your genetic location in between these sample groups. With the regional scores functioning as coordinates if you like. However it will by default only be a rough estimate as more fitting sample groups to compare with may very well be missing. The first map below clearly shows the inevitable genetic overlap, which is actually even greater than shown here by Ancestry.com. All of which to be explained by the shared regional history of the widespread Bantu migrations. Learning about the socalled Bantu Expansion is therefore essential to place these results in their proper context. In the very last section of this page i will discuss the implications these results might have for Afro-Diasporans. Generally speaking when it comes to tracing back the main strains of regional African lineage for Afro-Diasporans in the Americas undoubtedly results from the Democratic Republic of Congo as well as Angola will be most relevant, given historical plausibility and cultural retention. Although also Cameroon, Mozambique, Madagascar and directly surrounding countries, such as Zambia, Gabon, Congo Brazzaville and Malawi are not to be overlooked. 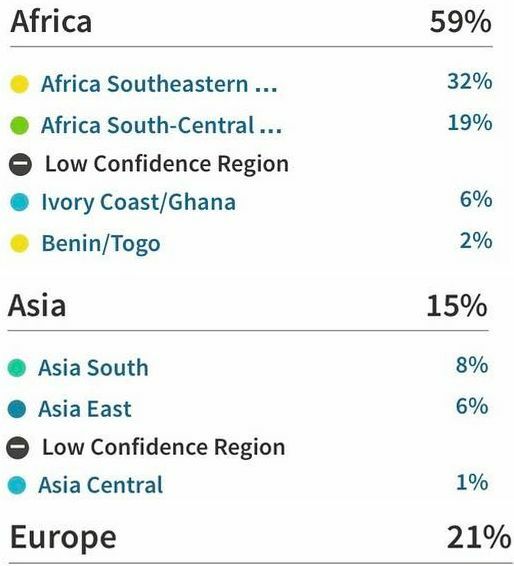 I like to thank all these Central and Southern Africans for having tested on AncestryDNA and sharing their results online so that it may benefit other people as well! 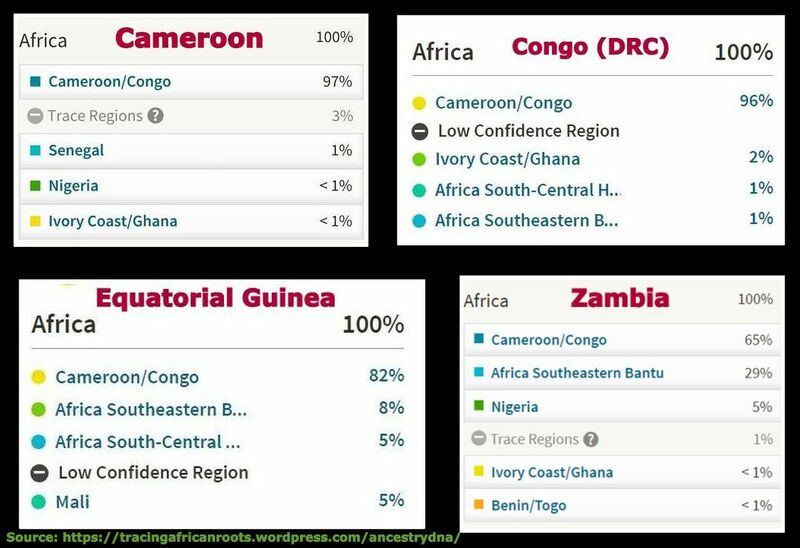 As shown in chart 2 above and also as will be seen in the screenshots below socalled “Cameroon/Congo” is the most characteristical AncestryDNA region appearing for Central Africans. Generally speaking and usually also convincingly so. However this is almost always combined with other regions showing up with smaller amounts. In particular “Southeastern Bantu” and “Nigeria”. It should be kept in mind that neither of these regions are confined to their AncestryDNA labeling. And due to the Bantu migrations originating in eastern Nigeria/Cameroon there will be genetic overlap for these three regions. This suggests a gradual dilution of the socalled “Cameroon/Congo” region when going in a southern and eastern direction. This is only natural given the current constellation of reference populations used by AncestryDNA. However – unlike mentioned by Ancestry.com itself – this region actually also appears in high amounts (>35%) in countries as far east as Kenya and as far south as Zimbabwe and Madagascar! An impression may be conveyed that this woman is a perfectly homogeneous “unicorn”. As this outcome does indeed imply that her DNA is a very near exact match to the Cameroonian samples used by Ancestry. Nevertheless this doesn’t take away from the fact that further down the line and when compared with other sets of sample groups she might actually be reported as having mixed origins (within Africa). As already suggested by her various GedMatch and DNALand results which seem to delve more into her ancient ancestral components. It must be pointed out though that these thirdparty tools have inherent flaws and without proper understanding their results can be very confusing or even misleading! Aside from the partial (yet overall minor) Igbo origins of this person it seems that an explanation for this remarkable outcome can be found in the Cameroonian samples being used by Ancestry.com hailing from the western part of the country while this person’s Cameroonian family is from the coastal & southern area (Buea, Akonolinga). 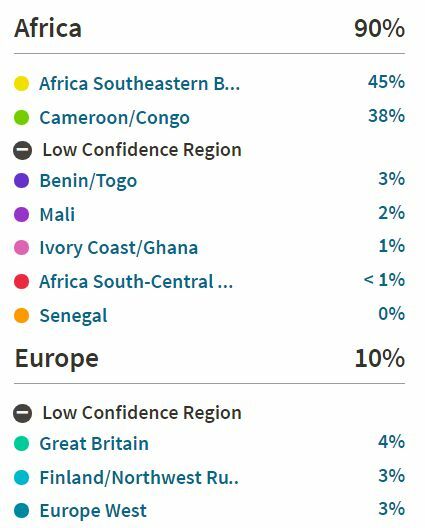 And apparently her DNA shows more similarity to the Nigerian samples being used by Ancestry.com rather than their Cameroonian ones, which were taken from a distinct part of the country and therefore can only represent a subset of the Cameroonian genepool. It provides a good illustration of how major genetic overlap does often occur between neighbouring countries. Also it teaches a good lesson that the ethnic diversity within any given African country cannot always be fully captured by just one single DNA category. Very interesting breakdown from one of the smallest countries of Africa. Equatorial Guinea is geographically situated between Cameroon and both Congo’s (DRC & RC). The “82% “Cameroon/Congo” score is therefore appropriate and as expected. The 5% socalled “Hunter-Gatherers” amount is also in line with minor yet very detectable Pygmy admixture in the Central African rainforest zone. I have no absolute certainty about the ethnic background but given that the Fang people are about 85% of the total population of Equatorial Guinea and this person is not from Bioko (Fernando Pó) island it is highly likely. Interestingly the Fang also live in Cameroon and are said to have migrated southwards relatively late in history (19th century). Their early history is somewhat contested but the 5% socalled “Mali” amount seems to be in support of Sahelian or northern Nigerian connections. The appearance of 8% socalled “Southeastern Bantu” in second place is also intriguing. It goes to show that this region is in fact also being reported for West-Central Africans. For a second result from Equatorial Guinea (confirmed Fang, but alas no screenshot available) the amount for this region was even higher: 13%! 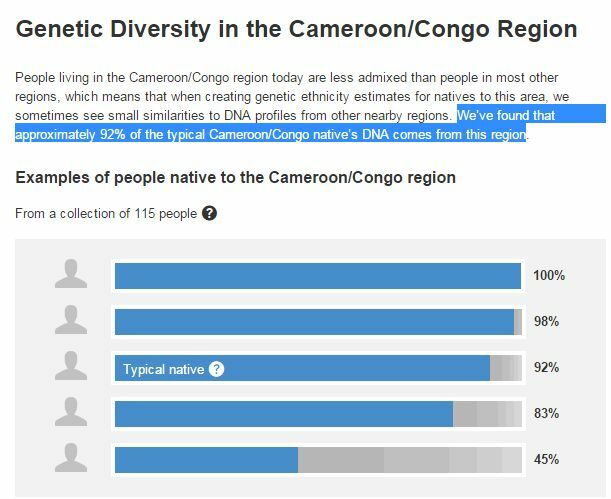 Yet again a very convincing breakdown proving that the socalled “Cameroon/Congo” region is able to accurately pinpoint both Cameroonian and Congolese origins. Obviously as long as there is close genetic similarity to the specific samples being used by AncestryDNA. 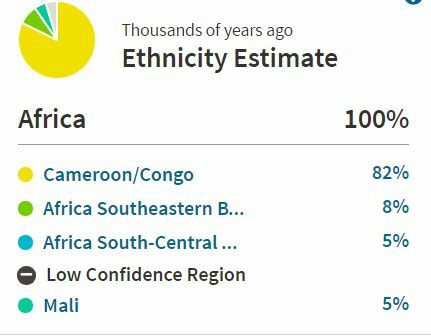 As described on the AncestryDNA Regions page, it seems likely that in addition to Cameroonian reference populations also Bakongo samples from Congo Brazzaville are being utilized by Ancestry.com for this region. The Bakongo (who also live in DRC and northern Angola) are often described as having been among the most numerous Central African captives caught up in the Trans Atlantic Slave Trade. Besides their genetic inheritance the Bakongo also left many valuable cultural legacies in various parts of the Americas. For more details on their former Kongo kingdom, see also these insightful websites. 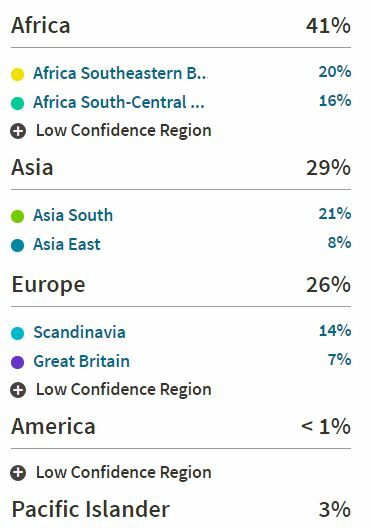 I actually have no certainty about the ethnic background behind these test results. But based on the very high similarity to Ancestry’s samples (96%!) i suspect a Bakongo or atleast western Congolese background is very likely. These results belong to a person who also made an excellent video sharing his results. It can be seen further below in the video section or by following this link. 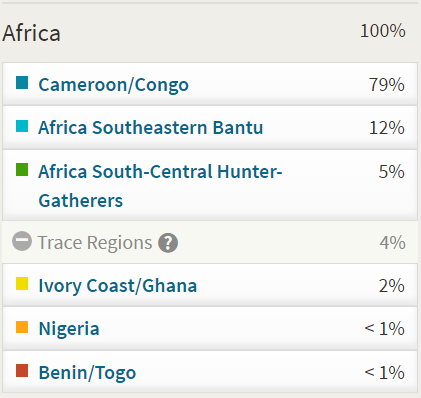 Even so, this AncestryDNA breakdown shows an impressive predominance of the socalled Cameroon/Congo region. It is admittedly only an individual result yet it still convincingly corroborates the predictiveness of the socalled “Cameroon/Congo” region. Looking at the remaining Trace Regions any minor recent Nigerian or Ghanaian ancestry would be very unlikely. These scores rather seem to reflect the difficulty of accurately delineating regional origins for a few tiny DNA segments. Remember that Trace Regions include estimates of zero%! Otherwise i suppose they might be seen as a very ancient signal of Bantu speaking migrations originating in eastern Nigeria/Cameroon. Given this person’s southeastern Congolese origins it is interesting that the “Southeastern Bantu” score seems quite subdued. Eventhough it is still present in second place. Also you might have expected a higher “South-Central Hunter Gatherer’s” percentage, as afterall the DRC is home to several Pygmy populations. As always individual variation might have played its part though in this particular outcome. Other Congolese results might very well look differently. I have no certainty about the exact nationality and ethnic background of the person whose results are shown above. However given his name i highly suspect western Congolese (either DRC or Brazzaville) or perhaps Gabonese origins. Still Zambian origins might also be a possibility. Especially given the higher amount of “Southeastern Bantu” when compared with the Congolese breakdown above. The above trace level score of socalled Hunter-Gatherers (=Pygmy) also seems distinctive. However other Congolese results are needed to establish firmer patterns. Very helpful to see this fascinating breakdown from Zambia! It demonstrates that the “Cameroon/Congo” region is also to be found to the south of Congo (DRC). And in fact i have also seen two preview ethnicity estimates already from Zimbabwe which likewise show a predominance of “Cameroon/Congo” combined with a substantial but still minor amount of “Southeastern Bantu”. If you were to go by the info provided by Ancestry.com you might have expected it to be the other way around. However given the known ancestral ties between Congo and Zambia this outcome seems appropriate. Even more so when comparing with the first Congolese result shown above which is from the southeast of DRC, bordering Zambia. Very similar breakdown as the previous Zambian result. Except this time no seemingly West African region being reported. Which makes it likely that the 5% socalled “Nigeria and also the 2% Trace regions for the previous Zambian were merely a misreading. I have no certainty about the nationality of the person whose results are shown above. Based on the name i am making an assumption it might be for a Zambian person. However any of Zambia’s neighbouring countries or even beyond could also be a possibility. Comparing with the previous two Zambian results the proportions of the two main regions seem quite similar. The Trace regions are however much more diverse and again showing West African regions. Without any further context it would be unwise to make any more assumptions. However the 3% socalled “Hunter-Gatherer’s” amount is quite likely an indication that this person’s origins are connected to the more forested parts of Central Africa rather than its savannah zone. 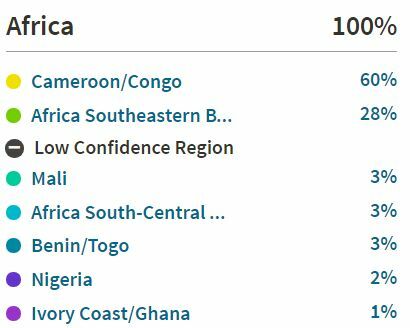 It seems telling that the “Cameroon/Congo” and “Southeastern Bantu” regions are being reported in almost equal proportions. This might very well also hold true for many other Angolans. Afterall Angola is mentioned by Ancestry.com in both regional descriptions. Also it seems self-evident that a genetic similarity is being detected for both Ancestry’s Congolese Bakongo samples as well as Ancestry’s Namibian samples. The Bakongo are afterall also an important ethnic group located in northern Angola (see maps on this page). While Namibia is located right across the Angolan border to the south. The socalled “Southeastern Bantu” region is clearly being mislabeled this time, as both Namibia and Angola are in fact Southwestern Bantu! Actually given this person’s partially southern Angolan family locations you might have expected a more pronounced socalled “Southeastern Bantu” score. However it seems not farfetched to assume that many Angolan Mestiços may have been rather mobile across the generations. Given their longstanding history of mainly living in trading cities. Quite possibly this may have resulted in a fair degree of cosmopolitan origins as well. Including ancestral connections with Brazil, São Tomé & Principe, Cape Verde and even Yorubaland/Benin. Afterall up till the mid 1800’s the socalled Mina Coast (a.k.a. 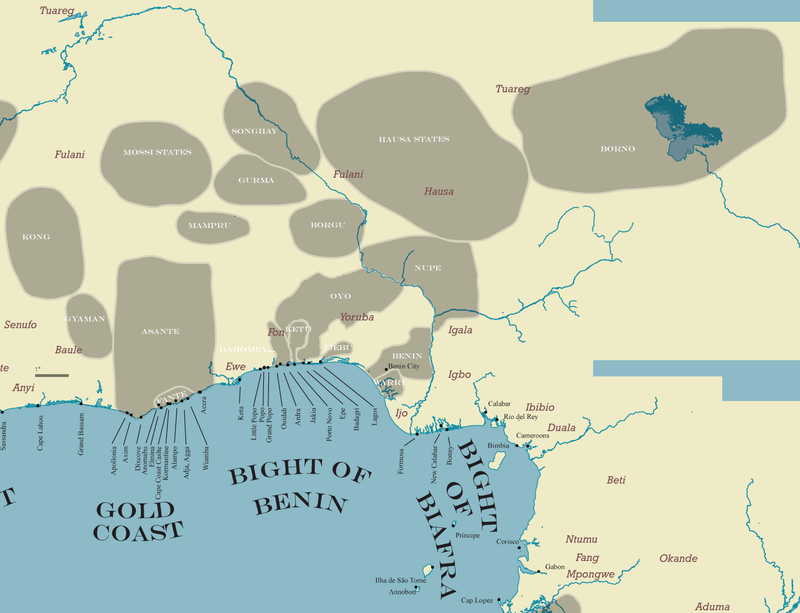 Bight of Benin) was a very significant trading post for the Portuguese. Which could perhaps offer an explanation for the relatively high “Nigeria” score of 6%. On the other hand the previous Zambian results also showed a small “Nigeria” amount of 5%. For both this may quite likely just be signalling a generic patch of ancient migrating Bantu DNA which cannot be properly identified by AncestryDNA right now due to a lacking sample database. The 4% North African score is undoubtedly related to this person’s Portuguese side. I have personally seen about a dozen Portuguese AncestryDNA results. On average it seems they are receiving a socalled “Africa North” score of in between 5-10%. As shown in chart 2 above and also as will be seen in the screenshots below “Southeastern Bantu” is the most characteristical AncestryDNA region appearing for Southern Africans generally speaking and usually also convincingly so. However this is almost always combined with other main regions showing up and sometimes even with (nearly) equal amounts. In particular “Cameroon/Congo” and “South-Central Hunter-Gatherers”. It should be kept in mind that neither of these regions are confined to their AncestryDNA labeling. There will be genetic overlap for these three regions due to limited sampling, the Bantu migrations, as well as widespread aborption of Pygmy and Khoi-San DNA in Bantu speaking populations and actually also the other way around! 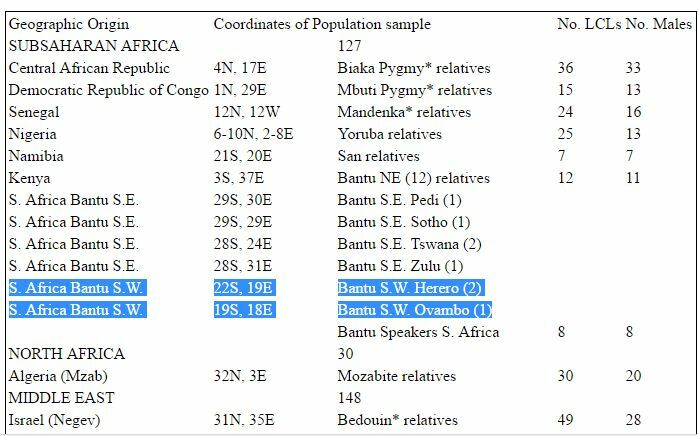 It should be kept in mind that the socalled “Southeastern Bantu” region is based on a very small number (18) of samples from no less than three countries! Not only from South Africa but also from Namibia and Kenya. Nevertheless a reasonably accurate assignment within the restricted range of 9 African AncestryDNA regions is still being obtained. But due to its very widespread coverage it does mean that actually also Northeast Africans receive high amounts of this region. For them it will undoubtedly almost always be due to genetic similarity with the Kenyan sample subset. But obviously for Southern Africans it will in almost all cases be mostly the result of genetic similarity with the South African and Namibian samples in AncestryDNA’s database. 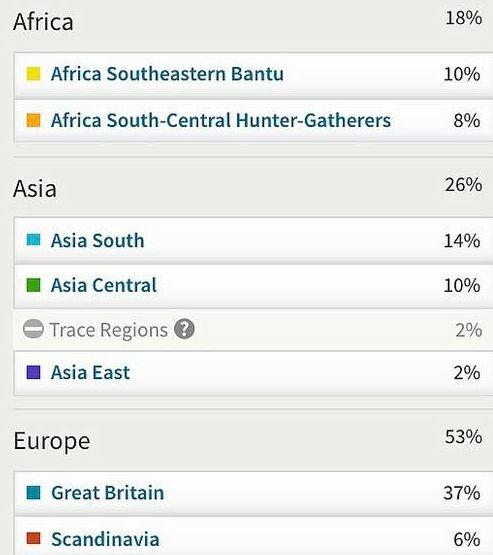 These results belong to a woman of most likely Zulu descent (judging from the family name). Her testresults are also shown in a very insightful video. It can be seen further below in the video section or by following this link. 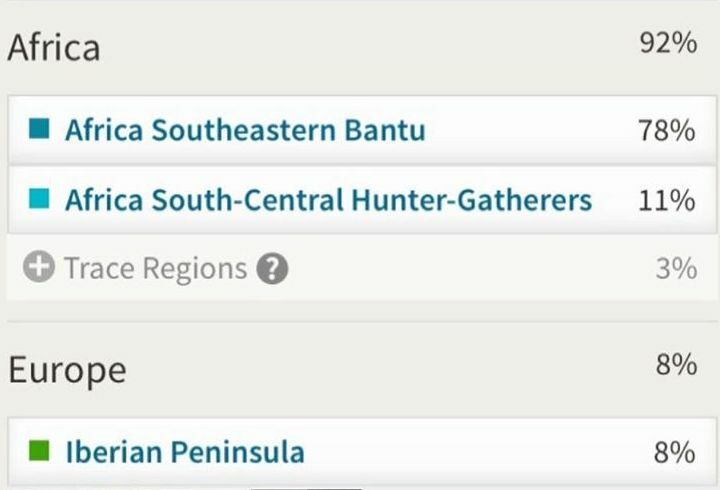 The almost perfect score of 94% for the socalled “Southeastern Bantu” region is striking but not surprising given that Ancestry.com uses South African Bantu samples to determine their estimates. 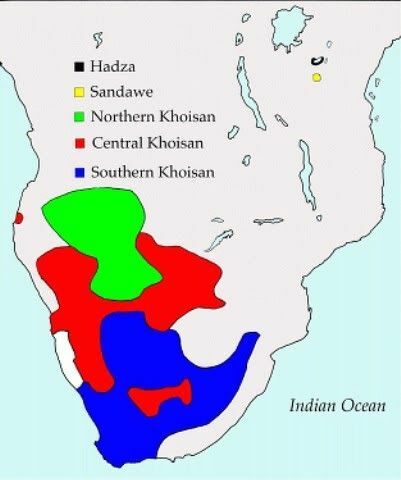 The socalled “South-Central Hunter-Gatherer’s” amount is also substantial and as expected given the absorption of Khoi-San DNA among Bantu populations across Southern Africa. Most likely this ancestral element will be more prominent for the Xhosa and especially the Coloureds from the Cape provinces. The less than 1% “Ivory Coast/Ghana” is almost certainly just noise. These results belong to a Xhosa woman. Her testresults are also shown in an amazing video. It can be seen further below in the video section or by following this link. Based on her relatively light skin complexion she mentions that growing up she was often assumed to be mixed or Coloured. In fact even also by black South Africans! In the USA again people would question her background guessing her to be Hispanic, West Indian or even Asian mixed. However despite her “ambiguous” appearance her testresults convincingly show her to be 100% African! Which goes to demonstrate how phenotypical diversity among native Africans is often underestimated. 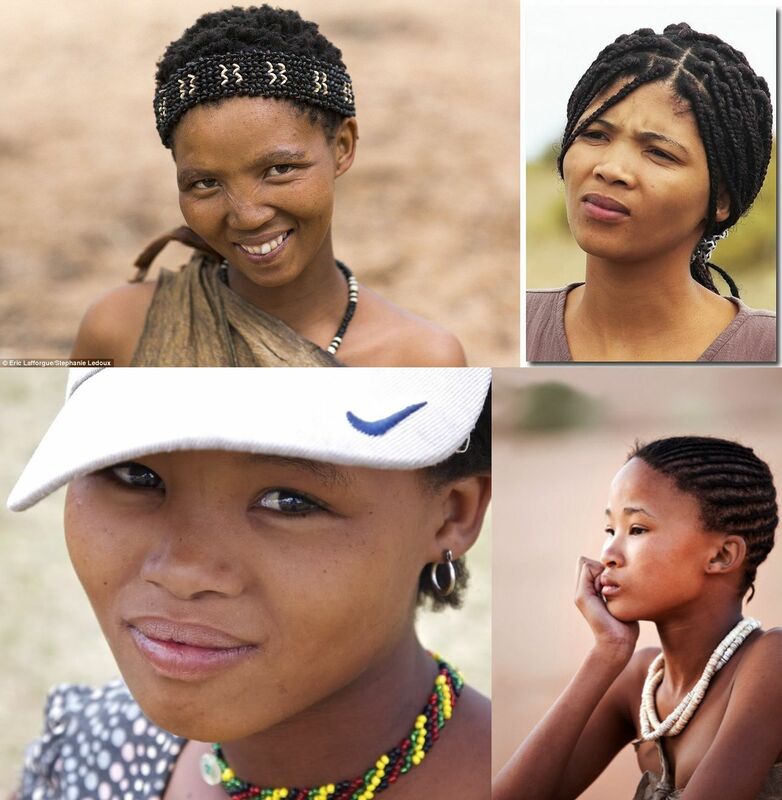 Given her Xhosa background it is actually not surprising that appearance-wise she shows much similarity to the Khoi-San people, not only in skintone but also in the characteristical eyeshape (often mistaken for being “Asian”). Given their close proximity in the Eastern Cape and generations of intermarriage it is known there is a considerable genetic link between the Xhosa and Khoi-San people. For example the late president Nelson Mandela, also Xhosa, was DNA tested for his parental lineages and his mt-DNA turned out to be L0, a Khoi-San marker (see this link for references). 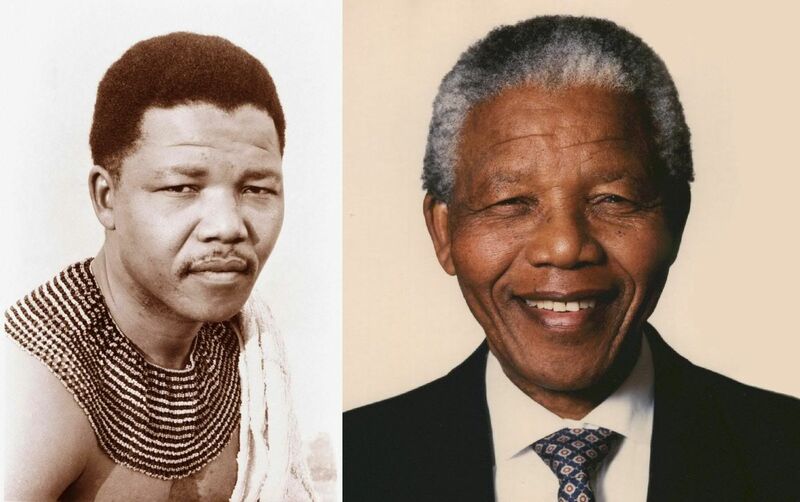 Mandela’s facial features by the way can also be said to have been markedly influenced by his partial Khoi-San origins. This connection is furthermore expressed in the typical Khoi-San click sounds which have been incorporated in the Xhosa language. In a recent DNA study (Petersen et al, 2013) this genetic contribution from the Khoi-San was estimated to have been in between 26-40% for 15 Xhosa individuals. The reported amount of socalled “South-Central Hunter-Gatherer’s” (13%) was perhaps a bit lower than you might expect. This region afterall serves as a standin for Khoi-San origins (atleast for South Africans). This is most likely because the socalled “Southeastern Bantu” region is incorporating some of the more ancient Khoi-San affiliations. Interestingly the same woman also uploaded her raw data into Ged-Match and received a more substantial estimation of her Khoi-San origins: 25% (on the EthioHelix calculator). This was to be expected as generally speaking the admixture analysis on Ged-Match delves more into ancient ancestral components. It must be pointed out though that this thirdparty tool has inherent flaws of its own and without proper understanding Ged-Match results can be very confusing or even misleading! For example unlike her AncestryDNA breakdown which correctly stated 100% Southern Africa this Xhosa woman is all of a sudden given a “West African” score of 30%! Eventhough on Ged-Match her Oracle estimate for 1 single population was very accurate (Xhosa), still the 2 population estimate (mixed mode) was very off with ~90% Xhosa being combined with ~10% various very unlikely West African ethnic groups (such as Mandenka and Dogon)! A very illustrative breakdown for how many South Africans will be described by AncestryDNA, atleast on their African side. A predominant socalled “Southeastern Bantu” score combined with a secondary but still very much present socalled “South-Central Hunter-Gathers” amount. I have no certainty about the ethnic background of this person. But judging from his name a Bantu speaking background is to be expected despite the minor and surprising “Iberian Peninsula” score. Which could very well represent a single distant Portuguese familyline from either Madeira or neighbouring Mozambique or Angola. As expected the predominant region being featured in their African breakdown is socalled “Southeastern Bantu”. As already mentioned this region is a very wideranging category. It could entail many different types of ethnic ancestry across a great part of Africa. It is important to always seek a proper context therefore (whenever possible). For South African Coloureds we can be pretty much sure that in this case the “Southeastern Bantu” % will be referring to genuinely Southern African ancestry but not per se from the country of South Africa! 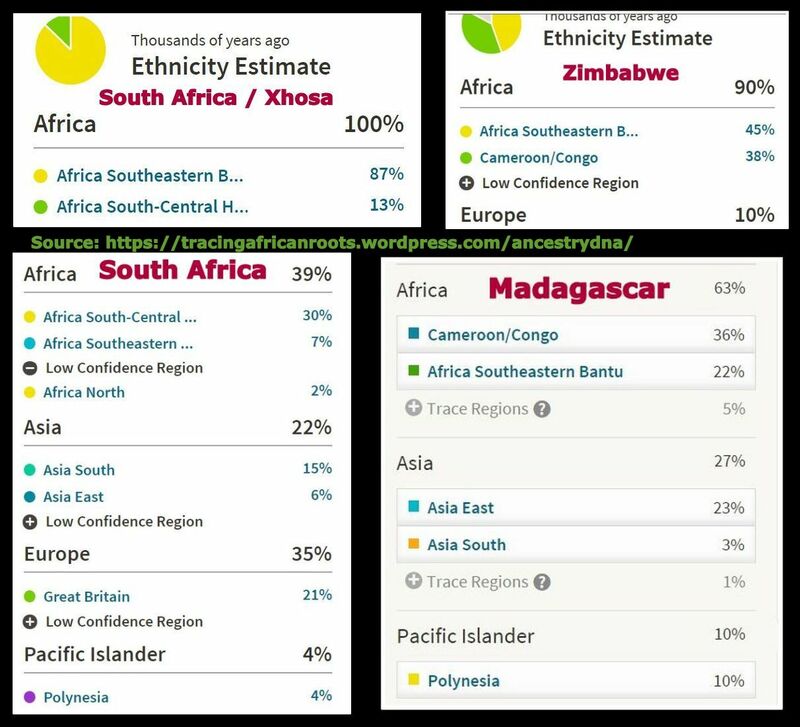 AncestryDNA does in fact use samples from the following South African ethnic groups: Pedi, Sotho, Tswana and Zulu (see also this overview). Very basic yet illustrative African breakdown featuring only the expected components in near equal proportions. The 10% socalled “Central Asia” seems a bit out of place. But it most likely associated with the South Asian heritage for this Coloured person. Highly insightful breakdown of a Zimbabwean. It demonstrates first of all that “Cameroon/Congo” is reported in high amounts also for Southern Africans. In fact i have seen other Zimbabwean results (only summaries though) which showed “Cameroon/Congo” as biggest region and “Southeastern Bantu” only as secondary region. Against what you might expect based on the labeling of these regions. Once again illustrating my oft repeated note of caution that the labeling of ancestral categories should not be taken as gospel. Of course given that both these main regions are associated with Bantu origins the breakdown still ultimately makes sense. Another fascinating aspect is the European score of 10% which goes very well with a quite likely great grandparent from England for this person. An expected DNA contribution would be around 12, 5% (due to recombination it will however not be exact). Eventhough 3 European regions are being shown most likely this part of his DNA was inherited solely from one recent ancestor. Madagascar is increasingly being discovered as a potential place of origin by African Americans who have taken a DNA test (most recently for 2 guests on this Finding Your Roots episode). Even if in almost all cases it will be a much diluted family lineage, Madagascar ancestry still seems to be surprisingly widely dispersed within the African American genepool. A crucial factor facilitating the identification of any possible Madagascar connection is the unique genetic blend of Southeast Asian and Southeast African origins, found throughout this island’s population. Something which can also be verified from the breakdown seen above. 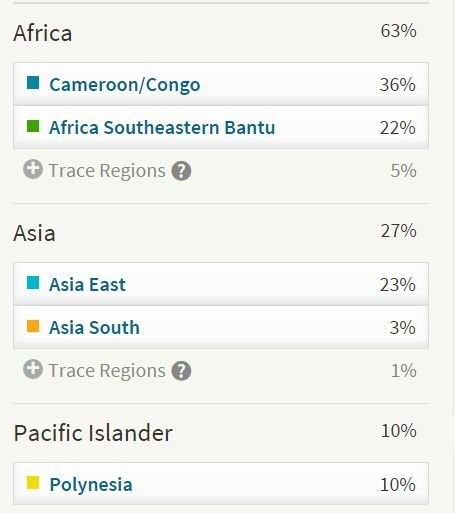 Because of a lack of a separate Southeast Asian region (23andme does have one!) it’s actually a combination of “Asia East” and “Polynesia” which serves as a proxy on AncestryDNA to capture this ancestral component (to be confirmed by viewing AncestryDNA results of Filipinos like this one). The inheritance of any Southeast Asian markers (either autosomal or haplogroups) among Madagascar descendants in the Americas is an invaluable help for establishing any ancestral link. The inhabitants of Madagascar, also known as the Malagasy, are however not a homogenously mixed group but rather consisting of many diverse ethnic (sub)groups. Undoubtedly they will therefore show much individual variation themselves in their admixture compositions. The person above is from the Toliara province which is located on the southwestern coast of the island. And she happens to show more African than Asian ancestry (interestingly also including some minor South Asian). Which means that naturally also the African breakdown should be taken into consideration. Aside from the neglible Trace regions basically it’s showing a combination of “Southeastern Bantu” and “Cameroon/Congo”. Rather than just “Southeastern Bantu” as might have been expected! 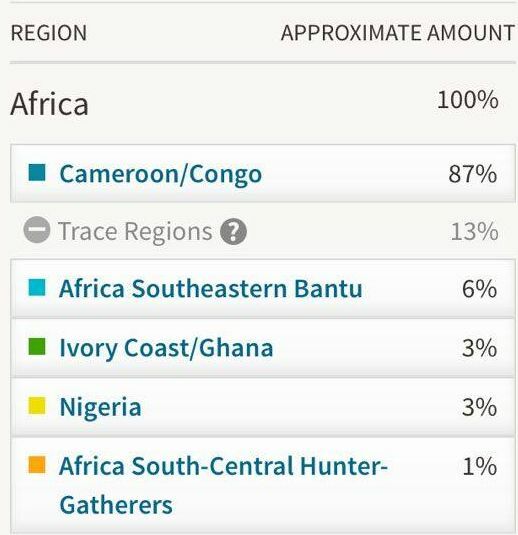 “Cameroon/Congo” even shows the higher amount of the two. Actually i have already observed such a combination for a Kenyan person (see North & East African AncestryDNA results). 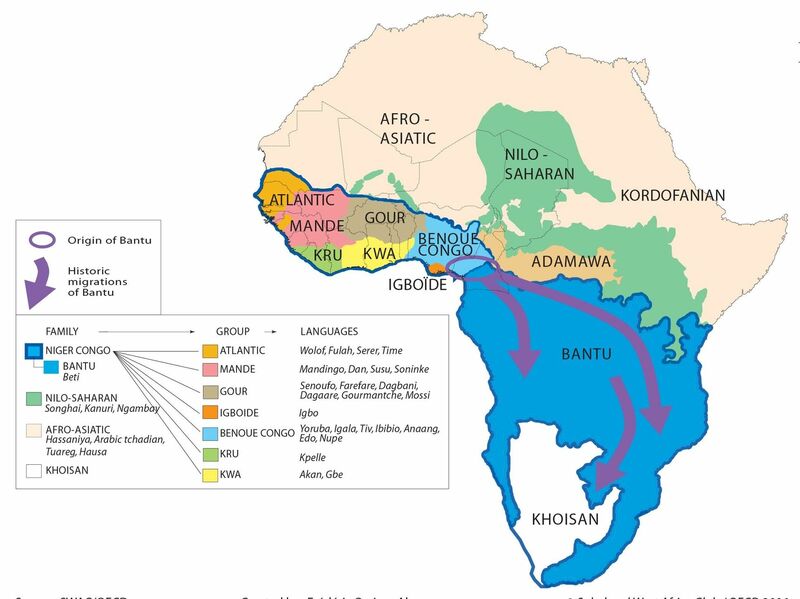 It suggests that Bantu speaking origins are not always going to fit in neatly in just one single category. Unfortunately this rather complicates how the socalled “Southeastern Bantu” scores across the Afro-Diaspora should be interpreted as well. As this individual example demonstrates you cannot assume “Southeastern Bantu” will refer exclusively to Malagasy’s African side. 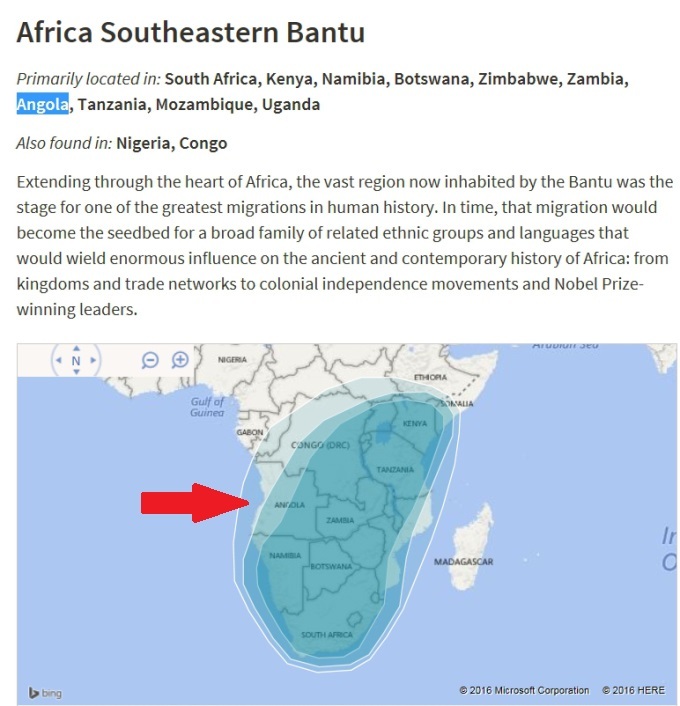 According to Ancestry’s website this socalled “Southeastern Bantu” region can be referring to origins from a VERY large area, streching all the way north up to the Horn of Africa and southwards into South Africa. To the east it indeed includes Madagascar but again according to Ancestry’s own info it might also capture ancestral connections with Angola to the west. 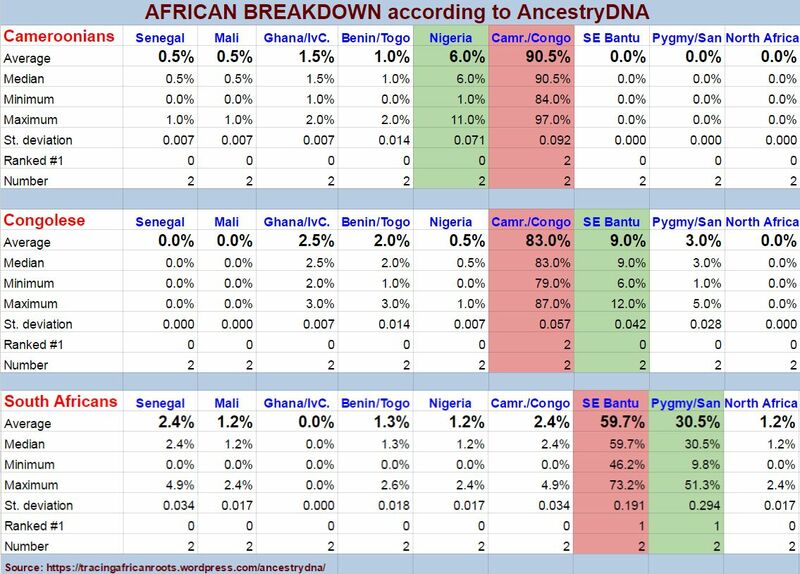 Despite the labeling (which should always be assessed critically on any DNA test) i actually think for most Afro-Diasporans it’s also likely to describe South*western* Bantu origins😉, in particular from Angola. Afteral the captives taken from that country far outnumber the ones taken from Madagascar, for practically all the Americas, incl. the USA. For more discussion see also the next section. How Did My Enslaved Kin Get to Va. From Madagascar? Mauritius is an island which lies rather remotely in the Indian Ocean but not that far away from Madagascar. It was uninhabited before the arrival of Europeans. Nowadays it’s one of the most ethno-racially diverse countries in the world. A reflection of this globally encompassing heritage can be seen in the results above which show a fusion of African, Asian and European origins. The socalled Pacific Islander regions very likely to be associated rather with both South Asian and Southeast Asian ancestry (by way of Madagascar). I will just comment on the African breakdown which shows a remarkable concentration of “Southeastern Bantu”. The African origins of the Creole population of Mauritius are fairly well documented and very fascinating. As you may expect from its geographical position most African captives brought over to work on the sugar planations of Mauritius were from Southeastern Africa, and more specifically Mozambique and Madagascar. Even though this person had a minor amount of African it is clearly the “Southeastern Bantu” fraction which is predominant (21/33=63%). Seemingly confirming the predictive accuracy of this region, at least in this particular case. It’s noteworthy that unlike the Madagascar result above “Cameroon/Congo” is not showing up in a significant way. Another remarkable aspect of the African composition is however the 9% “Ivory Coast/Ghana”, which is above trace level. Even with Mauritius being all across the other side of the continent it is still known and documented that also many West African captives were brought to Mauritius by the French, from Ghana and Benin but even from Senegal. This outcome is therefore a corroboration of how even the African side of Mauritians can be quite diverse already within itself! 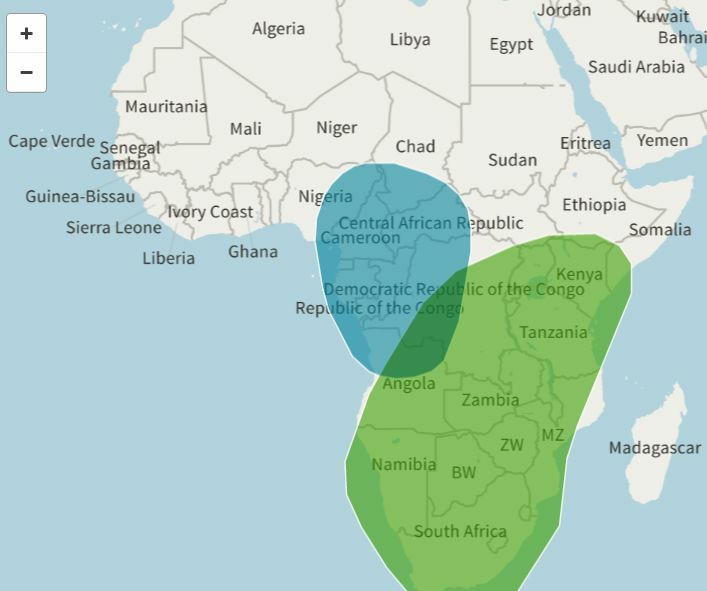 A very insightful selection of Central & Southern African AncestryDNA results has been shown on this page. Even if still quite limited in number and scope. In particular analyzing results from the Congo as well as Angola will be most relevant when it comes to tracing back the regional African lineage of Afro-Diasporans in the Americas. Followed with some distance by Mozambique. Given that an overwhelming majority of enslaved Central & Southeastern Africans was shipped through and also hailing from these countries. Furthermore the cultural retention from these countries among the Afro-Diaspora is pivotal and undeniable. It is well advised to remain cautious when exploring any genuine ancestral ties with Cameroon despite the country name labeling being applied by AncestryDNA. 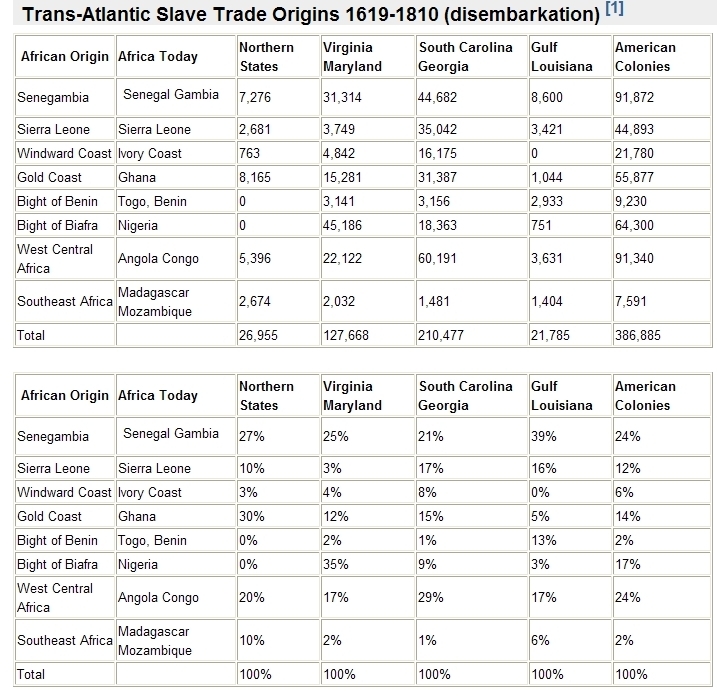 Historically speaking it is known that the participation of ethnic groups from Cameroon in the Trans Atlantic Slave Trade was relatively quite minimal. According to estimates only about 5% of all the people being carried off from the Bight of Biafra (= eastern Nigeria + Cameroon). 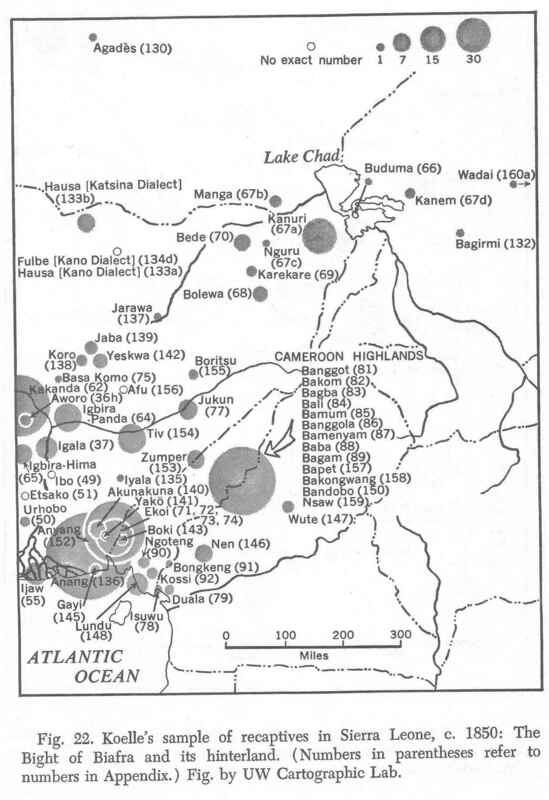 Although the true share might be somewhat obscured due to the fact that mainly slave ports nowadays located in eastern Nigeria were being used (such as Calabar). Rather than slave ports located on the Cameroonian coast (such as Bimbia) which was the least frequented part of the Bight of Biafra together with Gabon. Still even for (old) Calabar which is closest to the Cameroon border it is assumed that Igbo captives made up a clear majority and not people of modernday Cameroonian origin. As can be verified from charts 3 & 4 shown above. 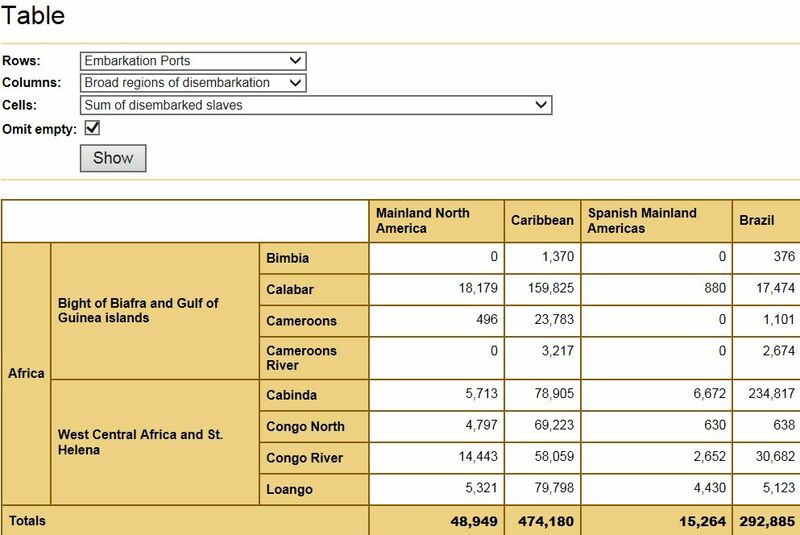 Furthermore (West-)Central African slave ports all combined are known to have exported even greater numbers than the most frequented ports (incl. 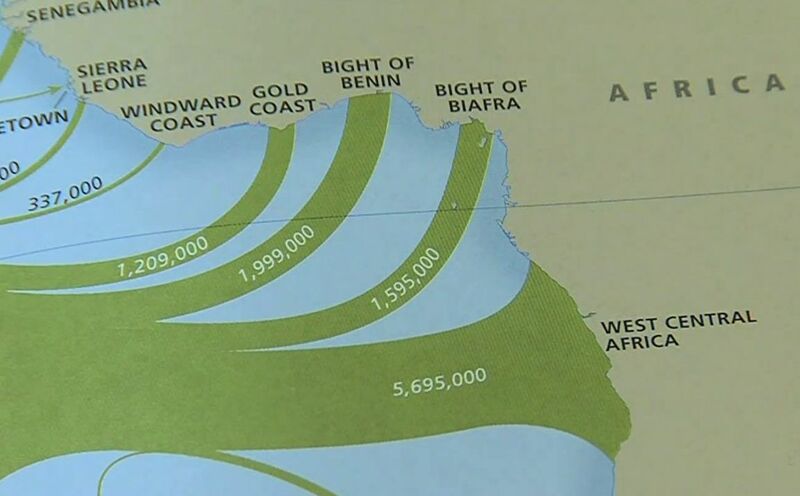 Bonny) of Bight of Biafra (chart 3 only showing a subselection) as can be seen in map 3. 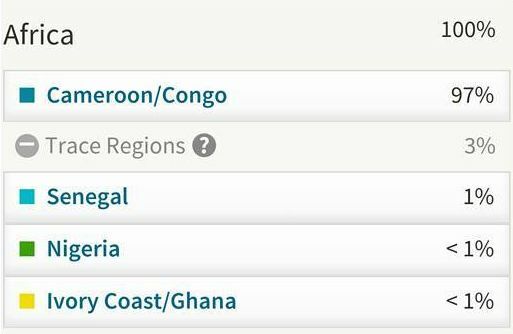 We have to keep in mind that samples from two very diverse countries, Cameroon & Congo, have been joined together in one single region named “Cameroon/Congo” on AncestryDNA. By the manner it has been designed this socalled “Cameroon/Congo” region is most unfortunately describing ancestral connections to both Central Africa and the Bight of Biafra hinterland. As we can verify from actual Cameroonian and Congolese results shown on this page, this socalled “Cameroon/Congo” region does indeed have a high prediction accuracy for both countries. However in addition it might also describe (Bantu) origins from other countries such as Angola, Zambia and even Madagascar! In theory therefore any of these places and also a combination of them might qualify as being the ancestral source for a socalled “Cameroon/Congo” score being reported for an Afro-Diasporan. The above chart 7 is displaying the current findings of my ongoing cross-Diaspora survey of AncestryDNA results (see this page for a full overview). We can verify that sofar the socalled “Cameroon/Congo” region is most prevalent among Brazilians and Haitians. 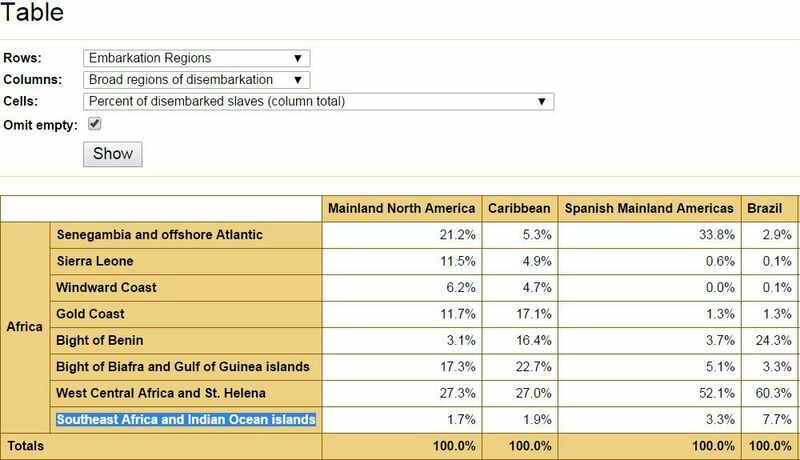 Which is in line with expectations as Brazil and Haiti had a greater share of slave trade with Central Africa than the other countries being mentioned in the overview (see this page). 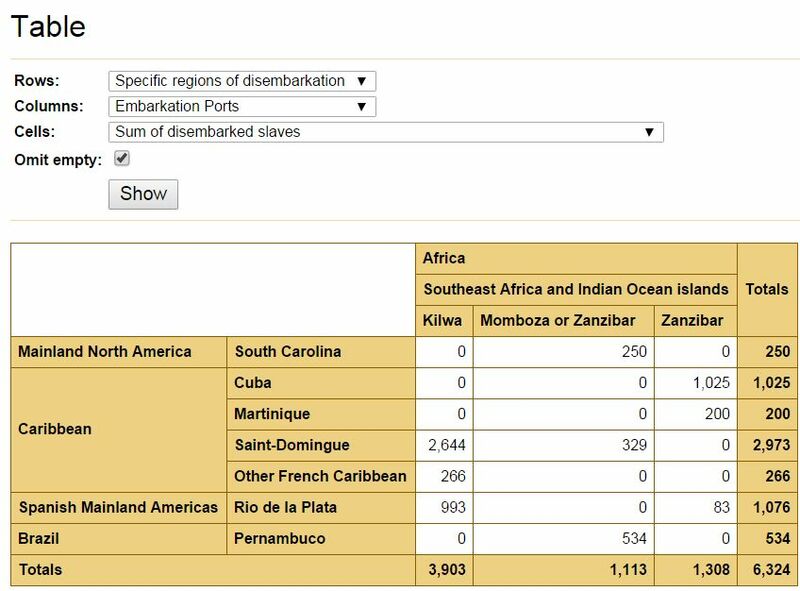 The other “Cameroon/Congo” proportions are usually also closely related to the documented share of Central Africa in Slave Trade for each nationality. Even more so when combined with the “Southeastern Bantu” scores. For example for the USA, “Cameroon/Congo” and “Southeastern Bantu” combined would be 26,5% (20% + 6,5%). Which corresponds very nicely with an estimated share of Central Africa in the slave trade to the US of about 25% (see this chart). Eventhough due to limited samplesize this data is preliminary it is still also cross-sectional because it was collected from various parts of the Diaspora and also at random. Overall contributing to the robustness of the data. Therefore based on these findings i am inclined to say that indeed on average “Cameroon/Congo” will be more likely to signal Central African (incl. Congo & Angola) origins rather than Biafran (southeast Nigeria & Cameroon) ones. Although again context is everything and combined with additional supporting evidence a Biafran or even a strictly Cameroonian connection could still be feasible in many cases. As Angola doesn’t have its own separate region yet on AncestryDNA (despite probably being the greatest souce of African slaves to the Americas as a whole) it is very likely that most of Angolan ancestry will be described by socalled “Southeastern Bantu” in combination with “Cameroon/Congo”. 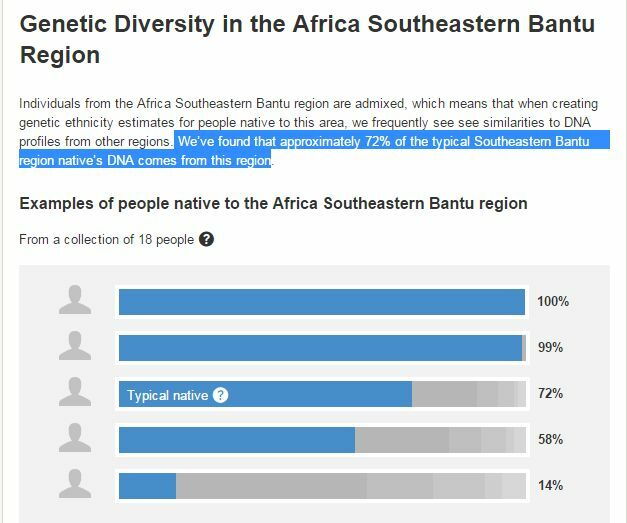 Undoubtedly given that only 18 samples were used by AncestryDNA there is much room for improving the socalled “Southeastern Bantu” category. Obviously adding samples from Mozambique and Angola will provide a much better picture.